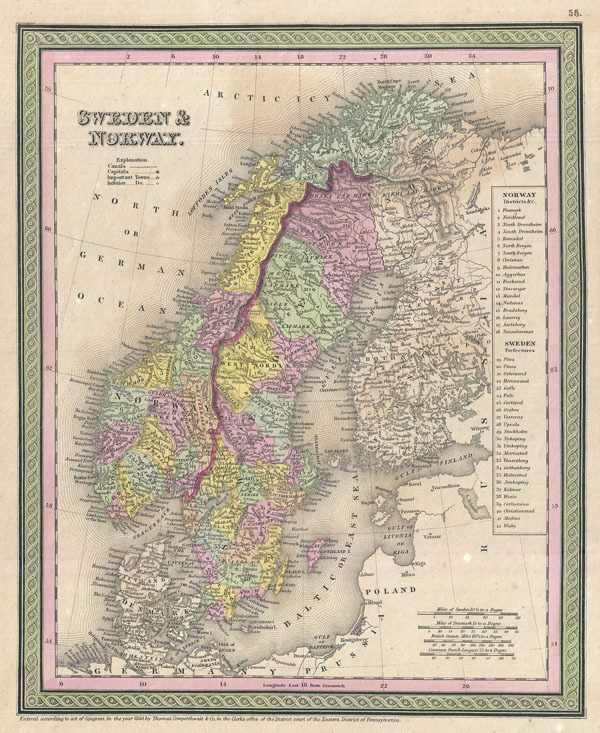 A beautiful example of S. A. Mitchell senior's 1850 map of Scandinavia, including Sweden, Norway, Denmark and Finland. Map shows Scandinavia in full with color coding according to region. A table to the right of the map details various districts and prefectures. In addition to towns, cities, rivers, and provinces, Mitchell also identifies an assortment of additional geographical and topographical details. Notes the legendary and semi-mythical whirlpool known as the Maelstrom (Mahl Strom) in northwestern Norway. Published S. A. Mitchell Sr. as page numbers 56 in the 1850 edition of New Universal Atlas. Good. Minor offsetting and overall age toning. Blank on verso.